We all love to see a great #HairTransformation photo. The Gordon family has spent several decades helping clients successfully pull off their desired color changes. 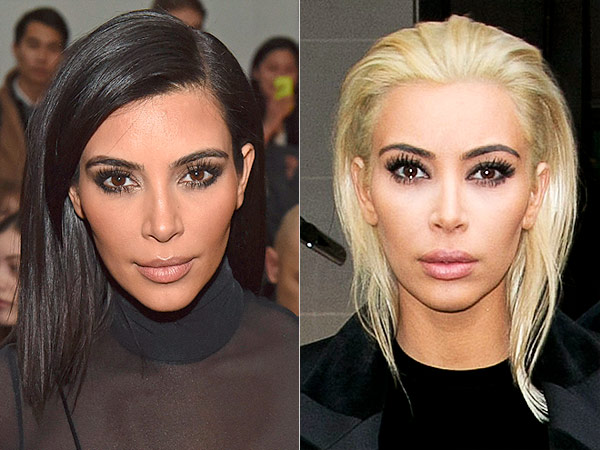 Despite what you see on Instagram from stars like Kim Kardashian West, taking your hair from jet black to platinum blonde is not something that should ever be done in one day. Walk into any salon as a deep brunette and ask for Kim K’s trendy cool-toned white locks, and you may find the stylist looking at you as if you are insane. The hesitant reaction from your hairdresser is because lightening hair requires the use of oxidizing agents that put your hair in a very vulnerable state. Applying too much of these agents at one time can cause irreversible damage to the hair cuticle, such as dryness, breakage and split ends. However, this does not mean the dramatic color change you are desperately wanting is impossible, it just needs to be done over a period of time. 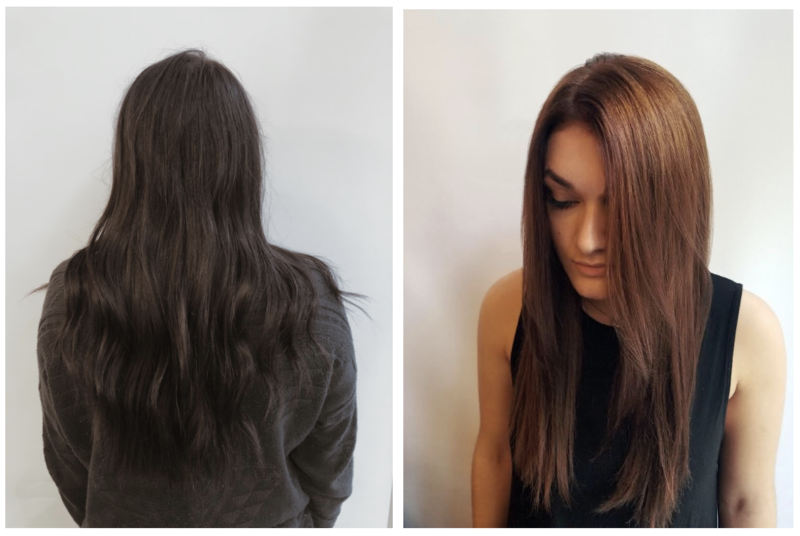 With patience, proper technique, and trust in your stylist, a dramatic change from dark to light can be done seamlessly without causing irreversible damage to your hair. My experience with Gordon Salon stylist, Kyle Stas (you can see more of his work on Instagram @kyle.stas), at the Lakeshore East location provides the perfect example of how to jump several shades lighter while protecting the quality of your hair. My hair journey began at a natural level of medium brown that was professionally lightened to be blonde. Last year, I decided to try something new and had my hair dyed very dark in an attempt to pull off Kardashian’s famous chic black color. When I was ready to take on the blonde life again, I had to be careful how I went about it if I wanted to keep the length and integrity of my hair. I knew I could put my trust in Gordon Salon and Aveda products to pull this off. As the client, your first step in the process of going from dark to light is understanding that this process will take multiple appointments. You should not expect to go from black to blonde in one sitting. As Kyle explained during my appointment, hair can only be safely lifted so many levels at once. Of course it is possible to apply bleach multiple times in one day, but at a certain point your hair cuticle is exhausted and will not lighten any further. Multiple applications will be required for drastic change. Whether you are naturally dark or removing dark color, spreading out your highlight appointments over a few weeks or even months is the safest way to achieve your ideal lightness. Trusting your hair stylist is the second step to success. On Saturday morning as I sat in Kyle’s chair, I had no idea what to expect. A lot of thoughts went through my mind. Would he be able to lift my old color out? Would I end up with bright red hair? An hour into my appointment, it is safe to say that my hair looked like someone poured Orange Fanta on my head, but there was no need to freak out. Luckily, because Kyle and I discussed the process during my consultation, I knew that this is a normal part of the color correction process. Once the toner was applied and my hair was dry, I could see my brown hair was several shades lighter. After letting my hair rest from the lightener for a couple of weeks, Kyle will be able to safely do the lightening process again to take me from light brown to blonde. Gordon Salon offers Olaplex treatments as an additional service that can be done in the shampoo bowl on the same day as your color, or as a separate appointment. Gordon also offers deep conditioning treatments as an add-on service. These deeply penetrating, quick treatments are a great idea for anyone who is looking to add moisture or protein back into their hair. Going from brunette to blonde without ruining your hair is totally possible. As long as you have trust in your stylist, are aware of what your hair is going through and how to keep it healthy, there is no need to be afraid of making the change you’ve always thought about. If you are planning on making the big jump from dark to light, be sure to ask your stylist about homecare products that can help maintain desired tone and repair damage.